I made this picture frame as a farewell gift to a friend who migrated to Finland in January. It was done in a basic decoupage technique. The wooden frame from IKEA was painted in Plaid Taffy and then I sealed the strawberry motifs. After that I varnished the whole frame. For the inside of the frame, I used scrapbook paper and a sentiment sticker. Of course if the person wants to put any picture, the quotation can be removed later. 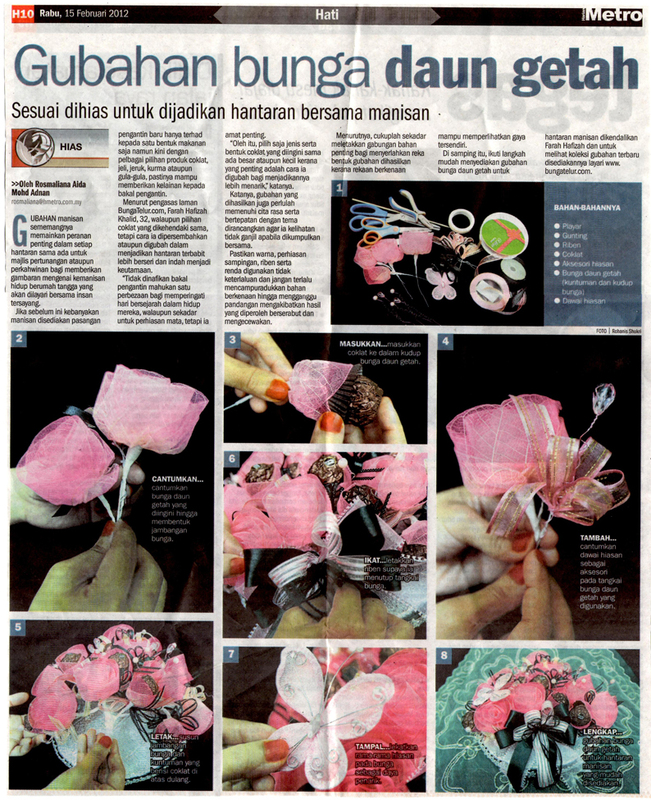 This came out on 22 March 2012 in Harian Metro. The last of 4 articles. 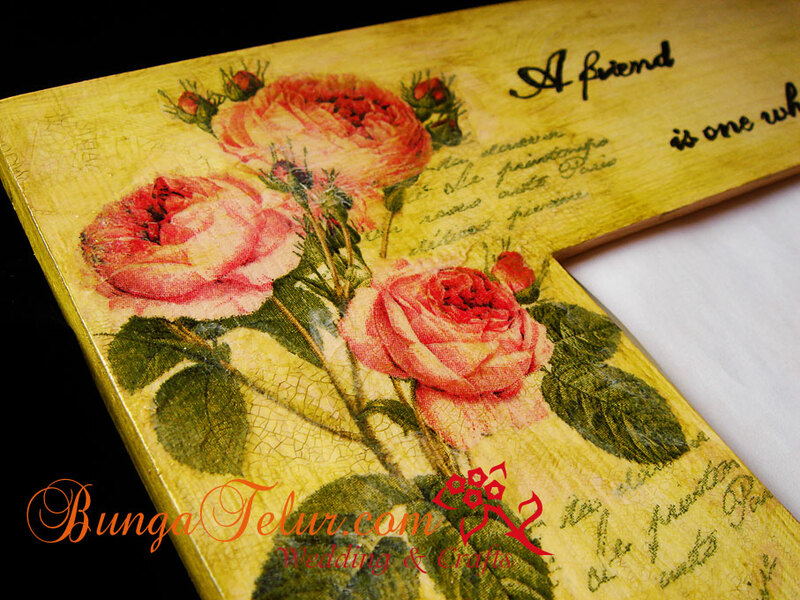 I made bunga dulang from bunga dip to accompany the box I decoupaged. The item for barang hantaran can be put inside the round box. 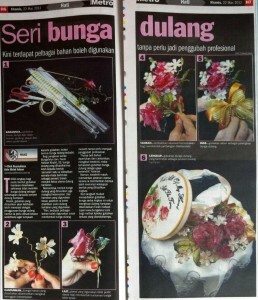 This gets published in Harian Metro 15 Feb 2012. Thanks to someone who bought the copy, saved and snail mailed it to me. For this particular gubahan coklat for hantaran, I used rose made from daun getah (rubber tree leaves) bought from a supplier. I took out the inner petals to fit in the Ferrero Rocher inside. It’s now available for sale at RM50 (not inclusive of the chocolate). If you are interested to buy, please leave comment. I bought this Malma frame from IKEA since last year and didn’t do anything with it until recently. 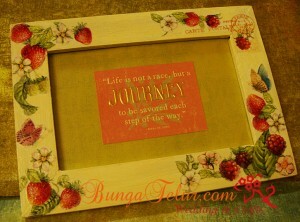 This time using the plain color Malma frame, I painted it in Plaid Taffy. After I have decoupaged the surface with the decoupage napkin with pink rose motif I decided to apply Jo Sonja Crackle Medium on top of it. Once it has started to crackle, I rubbed in Plaid Forest Green. The Crackle Medium used creates a tiny, porcelain like cracks that are quite hard to notice unless you rub in a second contrast color than the surface. Oh, the wording has been printed on paper, traced on tracing paper then traced again using graphite paper on the frame surface. I colored in with black acrylic paint using a liner brush. Some people prefer to use marker pen for wording but I always color in my wording using acrylic paint. This way I don’t have to worry about the marker ink bleeds when I varnish the finish product. Overall I was very pleased with the result. 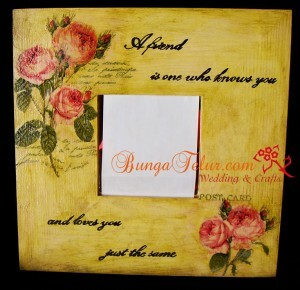 The frame has been given to a friend as a gift.